There are two primary output operating modes for most power supplies: constant voltage (CV) mode and constant current (CC) mode. While you don't set the mode, you do set the output voltage setting and the output current setting. Then, the output operating mode is determined by what you connect to the output (the load). If the load current is low enough such that the current that is drawn is LESS than the current setting, the power supply will operate in CV mode regulating the voltage at a constant value with the current determined by the load. If the load current is high enough such that the load is trying to draw MORE current than the current setting, the power supply will limit the current at the current setting value and operate in CC mode regulating the current with the voltage determined by the load. 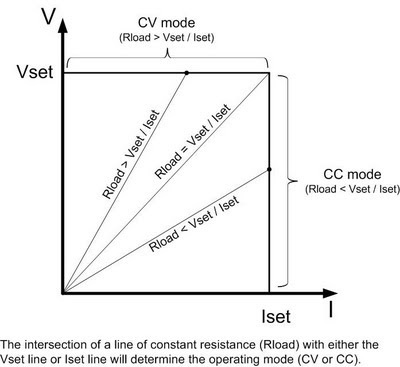 If Rload > Vset / Iset, the power supply will be operating in CV mode. If Rload < Vset / Iset, the power supply will be operating in CC mode. The two extreme examples of the above are with Rload open (near infinite ohms) and Rload shorted (near zero ohms). When a power supply output is open (Rload = infinite, a vertical line from the origin on the graph), it should be obvious that the output will be in CV mode with no current flowing. When a power supply output is shorted (Rload = zero, a horizontal line from the origin on the graph), it should be obvious that the output will be in CC mode with near zero voltage. 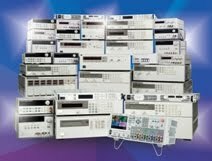 Note that Agilent power supplies typically show the dynamic operating mode on the front panel. If the power supply is unable to regulate either the voltage or the current, the indicator will show UNR (unregulated) since neither the voltage nor the current is being regulated. This condition is rare, but can happen sometimes if Rload = Vset/Iset, or if there is a problem with the internal circuitry.